Reference: ‘The Good Think-Tank Guide’, Economist, vol 321, no 7738, 1992. The Heritage Foundation promotes deregulation of industry, limited government, an unrestrained free market and privatisation. The Economist’s Good Think-Tank Guide described the foundation’s ideology as ‘red-blooded, celebratory capitalism’. Reference: James A. Smith, The Idea Brokers: Think Tanks and the Rise of the New Policy Elite, New York, Free Press, 1991, p. 286; David Ricci, The Transformation of American Politics: The New Washington and the Rise of Think Tanks, New Haven, Yale University Press, 1993. The Heritage Foundation was formed in 1973 by a group of “conservative legislative aides” with a budget of more than $250,000. Early support came from beer magnate Joseph Coors (pictured) and petroleum tycoon Edward Noble. By 1983 it was spending $10 million a year and it had bought its own building in Washington DC. It had become one of the dominant conservative think tanks in the US. Reference: James A. Smith, The Idea Brokers: Think Tanks and the Rise of the New Policy Elite, New York, Free Press, 1991, pp. 200, 286; David Ricci, The Transformation of American Politics: The New Washington and the Rise of Think Tanks, New Haven, Yale University Press, 1993, p. 29. The Foundation was extremely influential during the Reagan years. It provided information to members of Congress and most of its policy recommendations, outlined in a document entitled Mandate for Change, were adopted by the Reagan administration. Edwin Feulner, president of the Foundation, received a Presidential Citizen’s Medal from Ronald Reagan for being ‘a leader of the conservative movement...who has helped shape the policy of our Government.’ By 1985 the Foundation was almost as large as AEI. 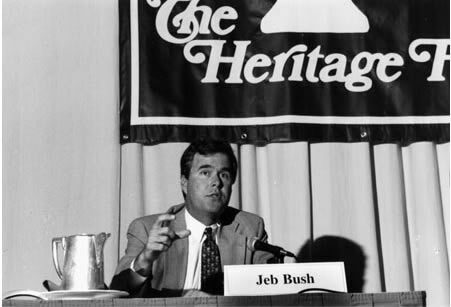 Jeb Bush, son of the former president, joined the board of trustees of the Heritage Foundation in 1995. Reference: Christopher Georges, ‘Conservative Heritage Foundation Finds Recipe for Influence: Ideas Plus Marketing Equal Clout’’, Wall Street Journal, August 10 1995, p. 10; 'The New Boys (2): Tanked Up', The Economist, vol 333, no 7893, 1994, pp. 26-7; 'Edwin Feulner, Jr’, The Heritage Foundation, November 1995. After George W. Bush was elected a Wall Street Journal journalist wrote: “no policy shop has more clout than the conservative Heritage Foundation.” House Speaker Newt Gingrich has said that “Heritage is without question the most far-reaching conservative organization in the country in the war of ideas” and he is reported to be “a regular visitor to the foundation’s plush building near Capitol Hill”. Foundation President, Edwin Feulner, was appointed by Gingrich and Republican Senate Majority Leader Bob Dole as Vice Chairman of the National Commission on Economic Growth and Tax Reform. Reference: 'The New Boys (2): Tanked Up', The Economist, vol 333, no 7893, 1994, pp. 26-7; Barbara Ruben, 'Getting the Wrong Ideas', Environmental Action, 27(1), 1995, pp. 21-6. Traditionally newly elected members of congress have attended Harvard’s Kennedy School of Government for their orientation programme but now Republican congresspeople went instead to a programme set up by the Heritage Foundation and Empower America to hear speeches from the likes of Charles Murray (of The Bell Curve fame) and Rush Limbaugh (right wing radio talk back host). Reference: Christopher Georges, ‘Conservative Heritage Foundation Finds Recipe for Influence: Ideas Plus Marketing Equal Clout’’, Wall Street Journal, August 10 1995. Reference: Sidney Blumenthal, The Rise of the Counter-Establishment: From Conservative Ideology to Political Power, New York, Time Books, 1986, p. 48; Winand Gellner, ‘The Politics of Policy "Political Think Tanks" and Their Markets in the U.S.-Institutional Environment’, Presidential Studies Quarterly, vol 25, no 3, 1995, p. 502; Christopher Georges, ‘Conservative Heritage Foundation Finds Recipe for Influence: Ideas Plus Marketing Equal Clout’’, Wall Street Journal, August 10, 1995; R. Kent Weaver, ‘The Changing World of Think Tanks’, PS: Political Science and Politics, vol 22, no Sept., 1989, p. 572; James A. Smith, The Idea Brokers: Think Tanks and the Rise of the New Policy Elite, New York, Free Press, 1991, p. 287. It was the Heritage Foundation that perfected the art of marketing ideas and forging contacts. Its policy analysts were assigned policy specialities and ‘expected to develop contacts’ on key congressional committees; to cultivate Congressional staff with lunches; and to keep track of the progress of bills in Congress. The foundation has traditionally spent only 40% of its budget on actual research. More than half its budget went on marketing and fund raising, including 35-40 per cent of its budget on public relations. All this marketing enables the Foundation to successfully attract mass media coverage for its publications and policy proposals. The Foundation claims that it usually gets 200 or more stories nationwide from each of the position papers it publishes. It also has its own syndicated newspaper features service. Reference: 'About Us', Heritage Foundation, 2009. The Foundation states: 'We believe that ideas have consequences, but that those ideas must be promoted aggressively. So, we constantly try innovative ways to market our ideas.' 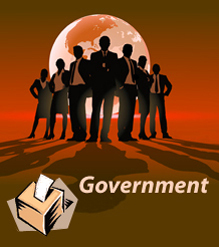 The Foundation aims its publications at government and the media rather than the public. Reference: James A. Smith, The Idea Brokers: Think Tanks and the Rise of the New Policy Elite, New York, Free Press, 1991. Its most avid consumers are members of the conservative congressional staffs who must brief their bosses and supply them with legislative arguments, pro or con; the conservative appointee in an executive agency who is leery of relying on the expertise of civil service employees and may want to consult with an ideologically compatible expert; and the journalist who wants to balance an article with insights drawn from an authoritative conservative source. Reference: R. Kent Weaver, ‘The Changing World of Think Tanks’, PS: Political Science and Politics, vol 22, Sept 1989, p. 567. The Foundation produces hundreds of publications every year including books and a quarterly journal, Policy Review. Its speciality is its ‘backgrounders’ or ‘bulletins’ which are short essays (between 2 and 20 pages) on current issues—“brief enough to read in a limousine ride from National Airport to Capitol Hill.” These are provided to government officials, employees and journalists without charge, and are usually personally delivered. Reference: Jeffrey L. Katz, 'The Conservative Idea Machine', Governing, February 1992, p. 53. The Heritage Foundation, like other think tanks, conduct public opinion polls as a means of—as a Foundation employee put it—“influencing public opinion, not just reflecting it.” This is done by selecting questions that will influence the results and then getting wide media attention for the supposedly objective poll findings. Reference: 'About Us', Heritage Foundation, 2009; ‘Right Wing Organizations: Heritage Foundation’, People for the American Way, September, 2002. The Heritage Foundation, the wealthiest Washington-based think tank, employs 244 people and has an annual budget of around $61 million, thanks to direct corporate donations, and indirect corporate donations through conservative foundations and individuals. Donor corporations include automobile manufacturers, coal, oil, chemical and tobacco companies. Reference: Winand Gellner, ‘The Politics of Policy "Political Think Tanks" and Their Markets in the U.S.-Institutional Environment’, Presidential Studies Quarterly, vol 25, no 3, 1995, p. 500; David Stoesz, ‘Policy Gambit: Conservative Think Tanks Take on the Welfare State’, Journal of Sociology and Social Welfare, vol 14, no 4, 1987; James A. Smith, The Idea Brokers: Think Tanks and the Rise of the New Policy Elite, New York, Free Press, 1991, p. 207. With an eye to the revolving door between think tanks and government positions, the Heritage Foundation and the Cato Institute have sought to nurture a new generation of conservative leaders within their ranks by sponsoring college students and promising junior bureaucrats and providing them with a place to meet and socialize. The Heritage Foundation also promotes a ‘talent bank’ of potential candidates for official positions in government administrations on the premise that its policies will be more influential if its people are in positions of influence. Reference: James A. Smith, The Idea Brokers: Think Tanks and the Rise of the New Policy Elite, New York, Free Press, 1991, p. 206. In the past two decades, the most important function served by the network of conservative think tanks has not been the germination of new ideas, but the creation of a ‘new cadre’ of professionals... Not only have the dozens of conservative think tanks created a framework for disseminating ideas that exist largely outside the established infrastructure of academic journals, university presses, and commercial publishing.... they have also designed career vehicles for conservative activists and thinkers.